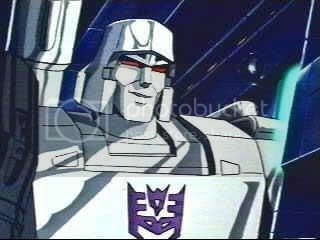 Megatron, is the star of the recently released DVD "Transformers," and leader of the Decepticons. He is also a giant robot from another planet who can change himself into a gun. Why is it that I attract so many men who lie? I'm really a nice person, and I do so much for the men that I'm involved with. Why am I treated like this? It's really frustrating. Relationships can be tough. I can't even keep track of how many times I've heard ex's scream for mercy just before I've blasted them to atoms with my laser cannon. I see a lot of you in me, Jessica, in that we both seem to destroy everything we touch, but that's OK. You see, everything we touch feeds our hunger for power. In the end, we'll rule our relationships even if we're the only ones left in them. This year, I didn't bring someone home for our family's Christmas dinner again *sigh* andsome of my cousins started this rumor that I might be a lesbian. I don't have a problem with gay people, but I'm not gay. I know it's not for a few months, but I can't bear to face another Christmas with them chiding me for being alone. What should I do? You know Maria, I'll be the first to admit that holidays can be hard. Last year, over at Starscream's we'd just opened presents, the Predicons had made some killer energon-nog, and I was in a really good mellow. Then Soundwave mentions how I never bring any Ladycons around and calls me a fag. You know what I said? I was like "woah dude, if I want to know what's on your mind, I'll splatter it on the wall and see for myself!" He sorta backed off from there. Next time the relatives start saying things that just aren't true, tell them to ease up, and remind them that one day you'll have your revenge. I'm 14 years old, a little overweight, and I've never had a boyfriend. Instead, they always treat me as "one of the guys." I've always dressed girly and lately I've been trying to wear more makeup and stuff, but they still don't notice. I'm waiting for a boy to ask me out, but I'm worried they won't notice because I'm not as grown up looking as some of the other girls. Hang in there Katie. I'm sure one day they'll realize you're not just "one of the guys," and until then don't force it. You might even want to go light on the makeup, let your true face show. If you're really concerned about your weight, I'd suggest just taking a healthy walk every so often, and wearing black, which has a slimming effect the boys will notice. Remember, the powers of darkness are greater than anything their pathetic minds can muster. Finally, don’t worry about not looking as grown up as some of the other girls. Your womanhood will fill out soon enough, and that tidal wave will devastate mankind across the face of the globe!